www.DancetimePublications.com The History of Dance: 500 Years of Social Dance from Dancetime Publications Description: Dancetime Publications specializes in the preservation, reconstruction and distribution of information on 500 years of our Social Dance History. Videos, DVDs, CDs, and texts are available. Night Work Press is pleased to announce the Tango Book! Night Work: The Tango Book is a collection of original fiction, poetry, and prose by tangueros who write. Night Work: The Tango Book includes two stories by stellar tango teacher and dancer Chelsea Eng and a poem by Dr. Rhoda Janzen, two-time winner of the UCLA Poet Laureate Award. To view samples of Night Work: The Tango Book go to: www.NightWorkPress.com. Night Work Press is a completely non-profit volunteer project done from the heart for the love of dance, writing, and community. Night Work Press is also the publisher of NIGHT WORK: A COLLECTION OF WRITINGS ABOUT WALTZ, 1999 Washington State Governor's Award nominee. An illustrated record of dancing from 9,000 to 5,000 years ago has been constructed from hundreds of artifacts of carved stone and painted scenes on pottery in the Balkans and the Middle East. The artifacts include painted pottery from Tepe Sialk, in what is now Iran, from the fifth millennium B.C. Dr. Yosef Garfinkel, who is compiling a history of early dance. Clockwise from upper left, dancing scenes on engraved stone from Nevali Cori, Turkey, seventh millennium B.C. ; painted pottery from Khazineh, Iran, sixth millennium B.C. ; painted pottery from Tchechme Ali, Iran, fifth millennium B.C. ; and painted pottery from Chigha Sabz, Iran, fifth millennium B.C. o one will ever know when someone first raised arms into the air, pivoted and took a few light steps this way and that — and danced. The birds and bees, those exhibitionists, were doing it their way long before. Some mammals were already courting through an unspoken poetry of motion. Humans may have been newcomers, but dancing as self-expression probably developed early in their cultural evolution, perhaps as early as speech and language and almost certainly by the time people were painting on cave walls, making clay figurines and decorating their bodies with ornaments. Archaeologists are at a loss to know the origins of dancing in prehistory because they lack direct evidence, nothing comparable to the art of Altamira or Lascaux. The best they have been able to do is extrapolate back from the ritual dances practiced by hunter-gatherer societies that have survived into modern times. An Israeli archaeologist now thinks he has pieced together a significant body of evidence for dancing, if not at its beginning, at least at a decisive and poorly understood transitional stage of human culture. 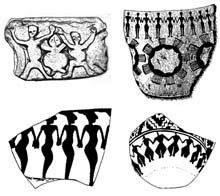 Examining more than 400 examples of carved stone and painted scenes on pottery from 140 sites in the Balkans and the Middle East, Dr. Yosef Garfinkel of Hebrew University in Jerusalem has established what he says is an illustrated record of dancing from 9,000 to 5,000 years ago. This record, apparently the earliest of its kind, coincides with the place and time hunters of wild game and gatherers of wild plant food first settled into villages and became pastoralists and farmers. It may take imagination to see in these depictions the choreographic ancestry of Astaire and Rogers or the Bolshoi. Some show only stick figures with triangular heads, and some headless, in highly schematic scenes that appear to be dances. Others include figures in a dynamic posture, usually with bent arms and legs. Several scenes depict people in a line or completely circling an illustrated vessel, their hands linked. There is some resemblance here to current folk dancing or even a Broadway chorus line. The prevalence of what appear to be dancing scenes in the earliest art from the ancient Middle East, Dr. Garfinkel said in a recent interview, suggests the importance of the dance in these preliterate agricultural communities. "Dancing was a means of social communication in prestate societies," he said. "It was part of the ritual for coordinating a community's activities. `Hey, it's time to plant the wheat or harvest it.' So everyone would gather and dance, and the next day they would go to work." Then with the emergence of states ruled by kings and bureaucracies and the invention of writing, all occurring in the region some 5,000 years ago, dancing scenes all but disappeared from pottery. People still presumably danced, Dr. Garfinkel said, but "the dancing motif had lost its importance in society." In the just-completed manuscript of a book on dance in the beginning of farming, Dr. Garfinkel writes: "In periods before schools and writing, community rituals, symbolized by dance, were the basic mechanisms for conveying education and knowledge to the adult members of the community and from one generation to the next. The lengthy duration of dance depiction as a dominant artistic motif, together with its dispersion across broad geographical expanses from west Pakistan to the Danube basin testify to the efficiency of the dancing motif as one of the most powerful symbols in the evolution of human societies." Although Dr. Garfinkel has been collecting and evaluating this evidence for eight years, his interpretation is new to many art historians and archaeologists. An early version of the idea was summarized in 1998 in an article in The Cambridge Archaeological Journal of England. Several scholars said the suggested link between dance and social communication in preliterate societies was intriguing and reasonable, though not proved. 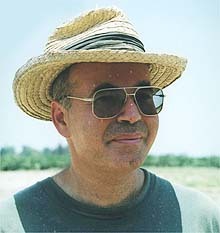 "I think Garfinkel is on the right track," said Dr. Kent V. Flannery, an archaeologist at the University of Michigan who specializes in early agriculture. Dr. Andrew M. T. Moore, an archaeologist and dean of liberal arts at the Rochester Institute of Technology, said he found the hypothesis interesting and worth further study. But he cautioned against any hasty acceptance of it. "I would be skeptical of any attempt to go beyond the depictions to actually reconstruct social behavior," said Dr. Moore, who has excavated an early agricultural community in Syria. "The scenes are extremely difficult to interpret. In the absence of a written record, we must be cautious in saying what people were doing and thinking." Both agreed that dance predated this pottery art by a great stretch of time, and that it probably had long had a social function beyond mere entertainment. For many thousands of years before they settled down, the thinking goes, people were nomadic hunter- gatherers who lived in small groups more like extended families. Once some of them in the Middle East settled into year-round camps, more than 10,000 years ago, they took up farming and congregated in village communities of as many as 200 people representing several families. Seeking more inclusive bonds, Dr. Flannery suggested, they probably "invented a fictional common ancestor as a way to integrate the community." This practice, he noted, had been observed in the Pueblo villages of the American Southwest. The villagers believed they were all descended from a common supernatural ancestor like the Great Coyote or the Great Eagle, and so all had an obligation to one another. Their rituals and dances, often elaborate, reinforced these beliefs. "Without strong leadership," he said, "ritual systems take on a huge burden of integrating people." Dr. Garfinkel contends that ritual dancing may have been essential in getting the work done in early agricultural communities. Hunters and gatherers could go out and almost immediately have results they could eat. Agriculture, by contrast, created a "delayed reward economy." "Before the harvest, there are various tasks to accomplish: land clearance, seeding and tending the fields," Dr. Garfinkel pointed out. "Thus, the beginnings of agriculture involved a cognitive revolution concerning the relationships between work investment and its final product." The new economy had to be understood and accepted. Festivals and ceremonies, including ritual dancing, may then have invoked supernatural powers to ensure a successful harvest if everyone pulled together. Nearly all the depictions, Dr. Garfinkel said, showed dancers in groups. Dr. Flannery said that Dr. Garfinkel was probably correct in relating the reduction in the dance motif on pottery to the rise of civilizations under kings, which occurred around 3000 B.C. with the Sumerians in Mesopotamia, a land that is now southern Iraq, and not long afterward in Egypt. "Real authority, with people on top issuing orders that had to be obeyed, had replaced the ritual dancing in integrating the community," he said. In time, art reflected the new official reality, portraying the king and his warriors and workers instead of dancers. Dr. Flannery offered a modern analogy. In the Soviet Union, May Day was celebrated with an official parade of arms on Red Square, a scene amply recorded on film, while faraway villages still held their peasant dances, which were not likely to be depicted in art. In his research, Dr. Garfinkel found the earliest examples of the dancing motif in art from two 9,000- year-old sites in the Middle East. Engraved on a stone basin, excavated at Nevali Cori in southeastern Turkey, were three human figures in a line, faces forward, legs wide and arms bent upward. The two outer figures are larger than the central one, suggesting a scene of two dancing men flanking a woman. Only in a few cases, mainly in art from early Egypt, Dr. Garfinkel said, are both sexes seen dancing together. At Dhuweila, a small camp site in Jordan, rock carvings depict a row of four human figures holding hands. They have elongated necks and heads that appear to be nonhuman. Dr. Garfinkel thinks they are wearing masks, evidence for which has been found at other sites. In later millenniums, most of the dance art has been found painted on pottery, usually small vessels for eating and drinking. As Dr. Garfinkel observed, the scenes emphasize dancing as a community activity. The focus is on a line or circle of identical figures moving in the same direction, indicating the importance of the group over the individual. "Dance is thus an activity through which society instills collective discipline in its members," he concluded. The dances also appear to take place in the open; in the few examples where some architectural elements are visible, the dance seems to be outside them. And since most of the dancing figures appear as silhouettes, it is possible the dance is being performed at night. Dr. Garfinkel expressed surprise that no musical instruments are seen in the motifs. In his book, Dr. Garfinkel acknowledged that not every question concerning early dancing could be answered. "Only a rough general outline can be reconstructed," he wrote. He also noted that the dancing scenes on pottery were made by local potters to be used by members of the same community. The images must have had immediate and contemporary meaning. Since the images reflected inside knowledge, he said, "it is justifiable to consider the dancing scenes as authentic documentation of dance activity." Dr. Moore, the Rochester archaeologist, said it might take time to judge the new interpretation. Although he found "the proposition an intriguing one," he said, scholars will probably debate its pros and cons for several years until someone comes up with more research that supports or sweeps away the hypothesis. Such is the usual practice in the scholarship of prehistory, the attempt to reconstruct a dim past from a few stones and shards, some of which may reveal people dancing in the dark through the seasons of life and toil in early agricultural communities.